An exploration of Cervantes’ novel, combining incredible visual imagery, anarchic performance and original music. The title role will be played by a secret guest performer, unique to each date. Don Quijote is a playful study of someone who follows their dreams without forethought or fear. It is about standing up for what you believe, regardless of recrimination from a cynical world. Central to this interpretation of the story is that Don Quijote can be represented by anybody; regardless of gender, age or physical ability. 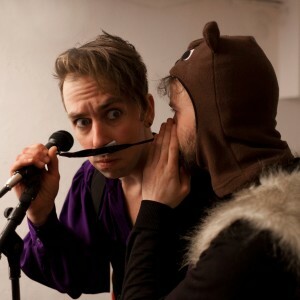 Joining the secret guest performer will be three performers, the core devising company, consisting of a two time Fringe First award winning theatre-maker, a musician/visual artist, and a dancer. The performance has been developed as part of Camden People’s Theatre’s Starting Blocks scheme, with support from The Albany Theatre and Shoreditch Town Hall. "A rich exploration of ideas, thoughts, moments and experiences. The raw creative energy of this piece was mesmerising." "Playful, searingly honest and making a serious attempt to address profound and complex ideas. Powerful, provocative stuff, beautifully played"
"A small thing of transient beauty"